We moved from Odiham and have been outside the Fox and Hounds for the last two nights.We had arranged to meet Sue, Graham, Matthew and Judith for a meal here last night but when I enquired they were fully booked inside-you can eat outside if you want! Well we did at the table by the tree on the basis we could always go into the boat if we suffered from hypothermia- a good wholesome meal was had by all. 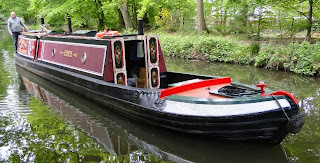 We have booked our slot down the locks starting on Wednesday which hopefully will be the start of the better weather. Today has been rather wet so thats why we have stayed put. Tomorrow is better so we have planned to do the return under the low bridges-starting with the lowest at Reading Road South. Matthew is coming along to give us a hand,especially Anne to take out the cratch board and lower the front section. Tuesday's weather looks bad so it could be a trip out somewhere from Mytchett. No TV tonight not even with my new digital pole set up,in fact we have not watched much TV at all since getting on The Basingstoke Canal because of all the trees - mind you there hasn't been much on- except Anne missed the Arsenal game. We also had other visitors today being Mark (Janet's son) with Maria, Ella and Lucas who gave the boat a checking out. We thought we had the canal to ourselves but we met these at a bridge hole-it disturbed our peace! We had decided that we would go and see Odiham Castle or as is locally known-King John's Castle near Greywell. After topping up the water tank we were nearly ready to leave when the trip boat John Pinkerton 2 ( he was the original contractor who built the canal) reversed to its collection point just in front of us-it had a pirates trip to the castle. Unfortunately it had just started to rain, they left and we had coffee to give them a head start. Just as we arrived at the castle the heavens really opened up for a good 20 minutes, JP2 was winding and then collected its soaked pirates for the return trip. We then winded,moored up and walked round the castle in the rain. The mooring is again under trees and the forecast for the afternoon was rain and strong winds-although after lunch the rain had stopped. I did a quick walk to the tunnel only about 500 yards further on but no boats allowed. It was well worth the effort and so was the castle. We left at 14.15 and went back to Colt Hill for the evening with some more rain when we arrived! Looking towards Greywell Tunnel- the line across the canal is the no entry sign! On walking towards the tunnel the water is so clear you can see the bottom.Nearly all the water supply for the canal comes from springs along this section to the tunnel. Well we have finally arrived in Odiham - 30 years after leaving it- but this time by boat on a canal that was derelict but had hope of being brought back to life- it took another 13 years. It was well worth all the effort to get here. We walked down London Road and passed our old house into the High Street which has had a great many changes but still has a lot of character. 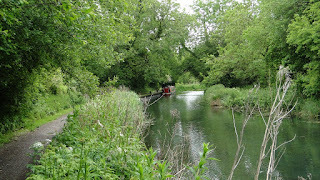 We did a walk along the canal to Broad Oak bridge then through Broad Oak Common back into Odiham which has had some large houses built along the lane. It has taken 30 years but Charles Church Builders have just started a new in fill housing development between the High Street and the bypass that was built just before we left. The town still had a lot of flags up for a Magna Carta event last weekend. Barley Mow Bridge Winchfield - Basingstoke Canal and a planned new town! Only a short cruise today of 4 miles but it did take 2 hours as the going wasvery slow but after leaving Fleet the scenery did start to open up. 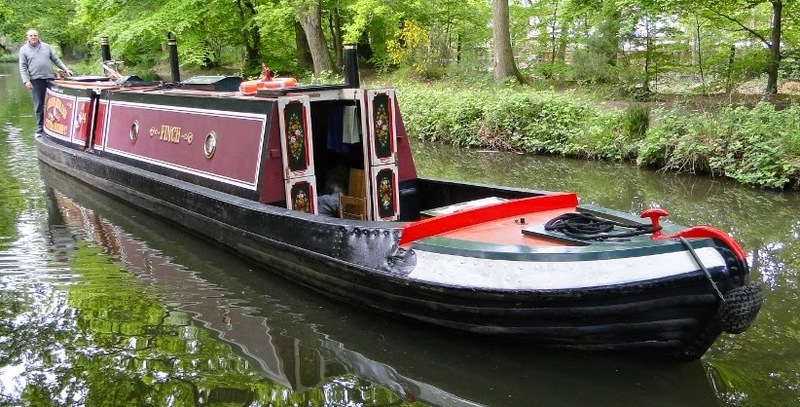 We saw three narrowboats moving today - its getting very busy it must be half term! The main problem with the canal is that there are only a few places that you can actualy moor which is a real shame as there are some really beautiful spots that you would wish to moor which I presume is due to its status as a SSSI. We had a special visit from Mavis and Brian this evening. I used to work with Mavis at Hume Pipe in Camberley over 27 years ago. They built the concrete elephant on the A30 in Camberley for a Lord Mayors Show in the 1960's when it was known as Trollop & Colls. Fleet Wharf on the Basingstoke Canal is also the lowest bridge! We were awake at 7am this morning debating the bridge issue and whether we should attempt it- my view is that we have come all this way and we therefore had to give it a go. It -the cratch and top box had to come down and be stored inside. The matter was finally confirmed when two lovely tugs arrived as we started on the work- they were returning from the Magna Carta weekend held at King John's castle just past Odiham. They looked at the boat and said that the top line of the cratch would catch probably the last of the four bridges. Our old friends who we have known for over 30 years Judith and Matthew arrived at 10am to provide moral and supportive humour to the events of the day. We set of at 10.30 in trepidation and made our way to the first obstacle Wharf Bridge 5ft 10inch but higher on the left- we would have made it with about 2/3 inches to spare. The next two at Pondtail Bridge both OK and then the final one Reading Road South Bridge which is the lowest and it would have hit the cratch if we had not taken it down- the top box is a bit lower than the cratch but would not have gone through the last bridge. We then stopped for lunch at the Wharf to celebrate and put the boat back together. Out for a meal tonight at El Castello as a final well deserved celebration. Now to the end! The flashes of wide open water are very impressive!!!! The aqueduct- I waved as we went over and a lot of people in the slow moving traffic below waved back-I wonder how many didn't know this bridge was a canal and therefore very surprised to see a bloke in a boat waving!!!! !